I made this so we can put up our development sketches so we can all see how our ideas evolved and how our designs are picked. 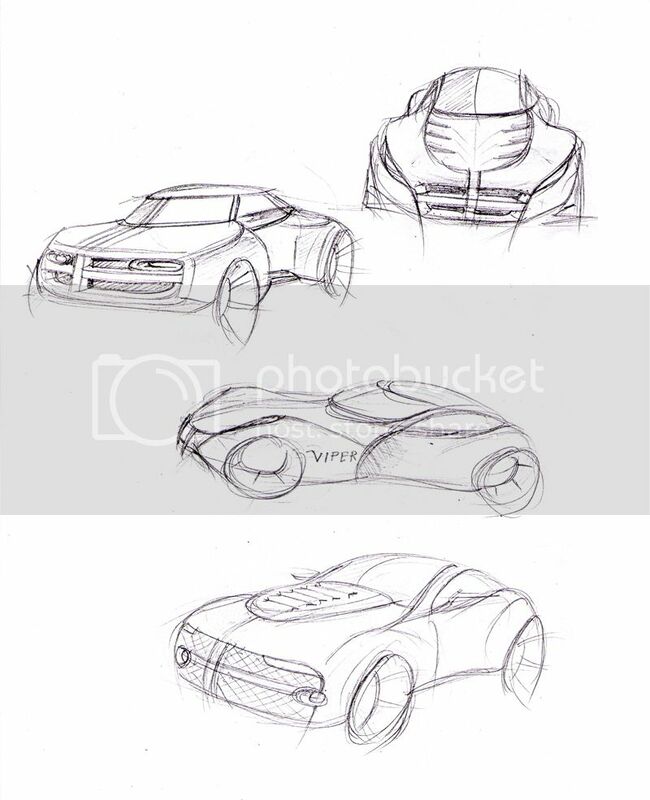 I'll start by putting forward some sketches for the dodge design battle. 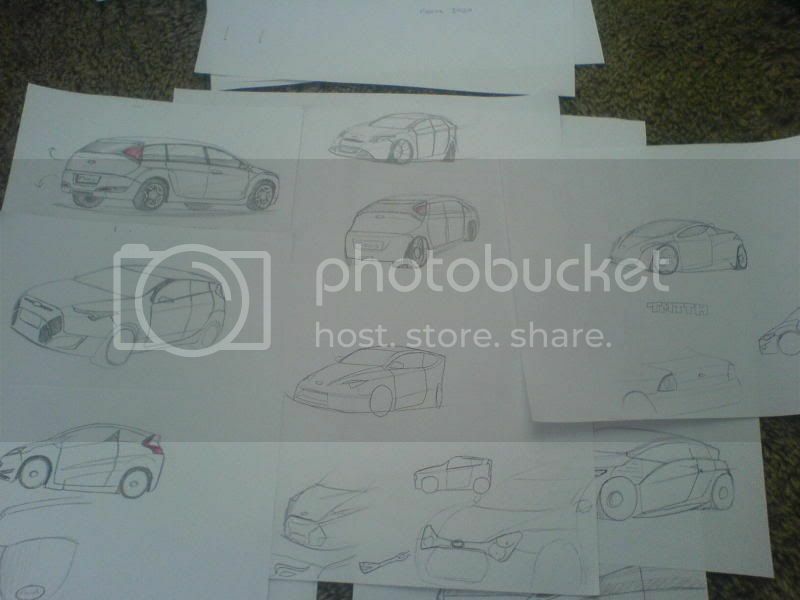 the first sketch ( top right ) was where my design direction started. I wanted to create a face that visually resembles an actual viper. the third one was my second ideation. For this I went for an even more visible snake look. with fangs included in the design. on close inspection it felt a little cheesy, but provided the stance for the final design. the last one was my third ideation. this I spent the most time with. constantly erasing and modifying the grille. The proportions were very nissan Z-ish. This was where the grille and headlight integration was developed. The final design borrowed cues from the first three and put them in a more cohesive package. will have to further develop this design in the future. these were for the dodge B segment contest. This was probably the most time consuming development as it took two weeks to fully develop, unlike one day for the dodge. My design basis was low cost and aerodynamic efficiency thats why I looked to the Rumpler Tropfenwagen which achieved a remarkable cdx of 0.28 in 1921. dodge had no history of small hatches so I had a great deal of freedom here. The first two sketches on the left were the first iterations of a modern Rumpler. The idea was not to go retro, but use similar principles. The third sketch on the left was an early interpretation of the rear. this was before I decided to introduce the swappable door feature which required a less dramatic window slope. 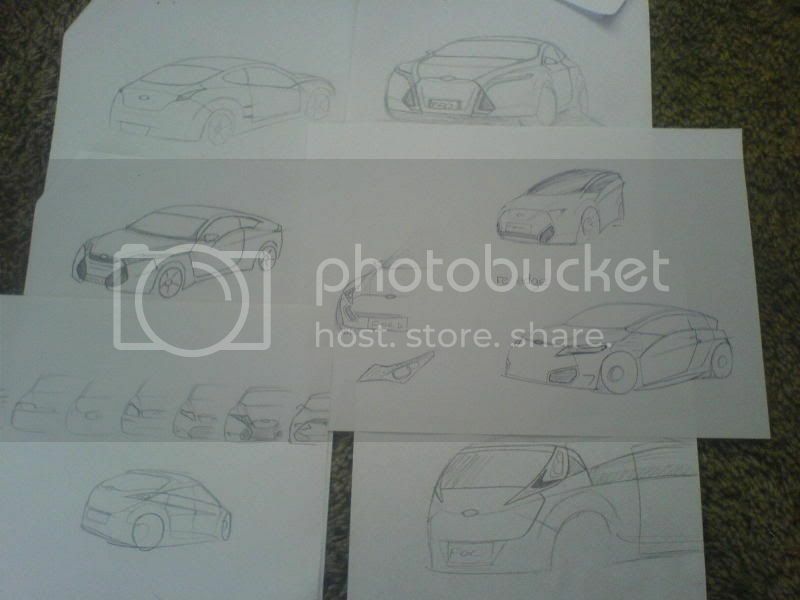 The first sketch on the right was a later ideation. this time I abandoned the rumpler aero principle for a steeply angled roof. this was where the final front end design was born. 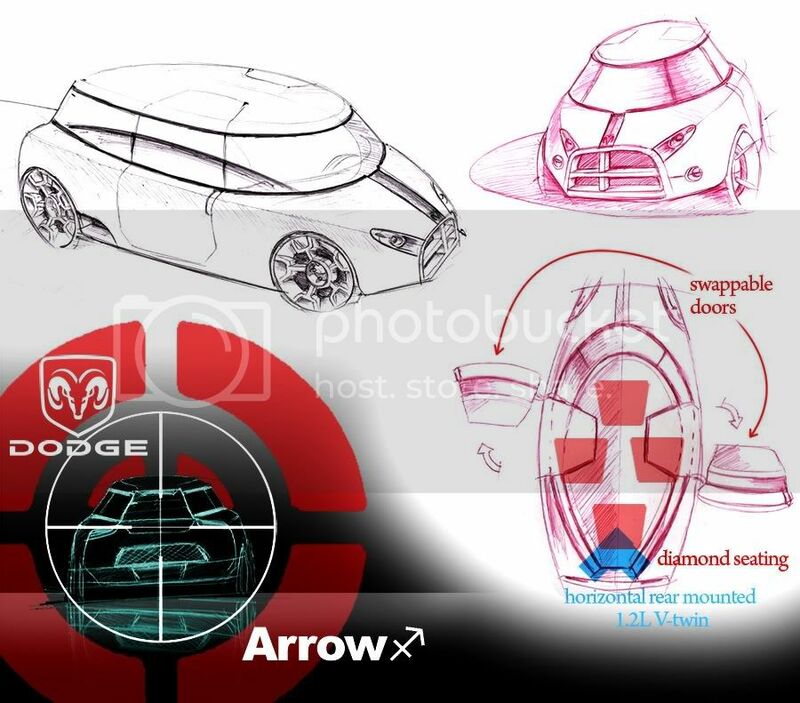 The below it was a more sculpted design as I explored the integration of dodge pick-up cues. a rounded roof and partially covered rear wheel arches were major design identities here. 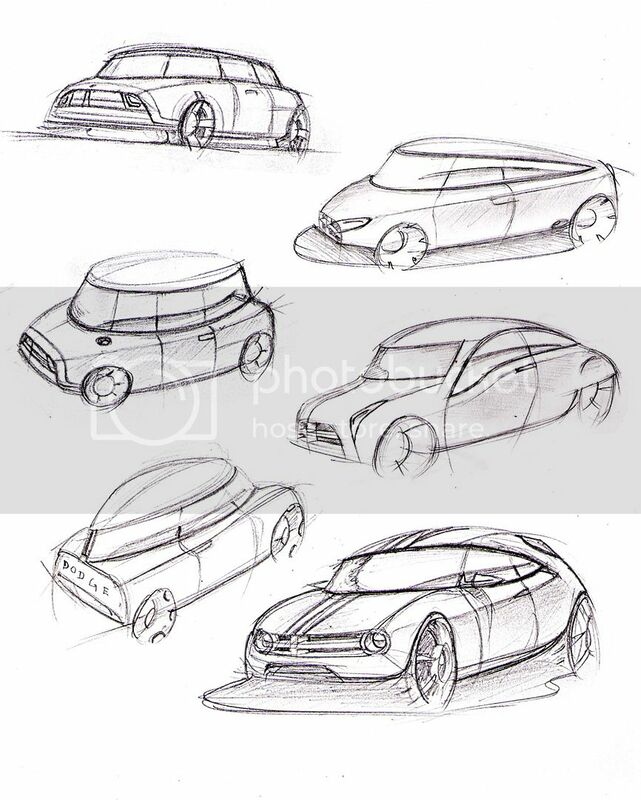 The bottom right sketch went for a more conventional hatchback profile. with challenger inspired nose. The rear with the high mounted taillight was heavily influence by the fiesta. and it came down to this and what became the final design. I went with my contest choice, because it was more innovative. The idea was to power the car with a V-twin engine developed by cutting one V pair of cylinders from the 4.7L HEMI i.e quater HEMI. In the end I think I should have gone the conservative route. I never for once thought the design was too innovative, I guess because I spent so much time on it, it became quite conventional in my head. 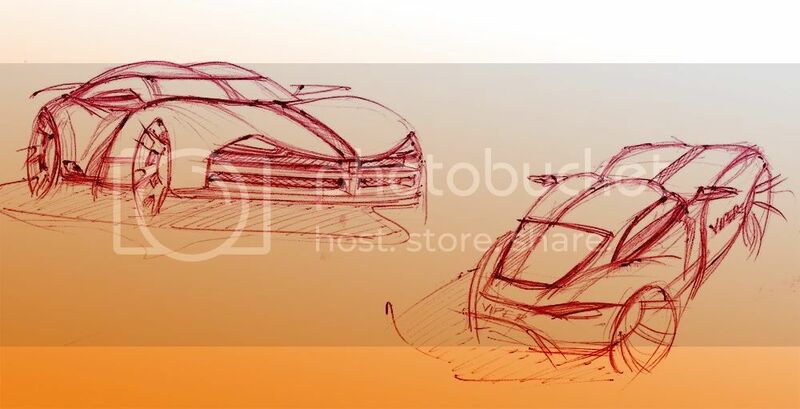 With the feedback from you guys, I will be modifying this concept into a future Citroen EV and will keep you guys posted on how that turns out. Last edited by taskbearer; 12-07-2008 at 08:11 AM. Sweet stuff... I really like the very bottom Dodge B-segment design. Especially the front; with a different greenhouse it would be fantastic. Wanted to breathe some new life into this thread so moving forward it would be great if you guys would post your development sketches here with a brief explanation on how you arrived at your final entry. Guess I'll get the ball rolling and talk a bit about my latest entry. Going into this contest, one of my biggest design influences was the Mustang, It is one of the most easily recognizable vehicles in the Ford lineup and I thought it would have been a great idea to build a design language around that iconic DNA. My initial sketch had too much Mustang cues so I decided to tone it down with some influence from the kinetic design language, with some Mustang influence. This set the ground work for the overall shape and coupe like proportions but the front end was a bit too safe and had little to no visual interest. One of the key elements that stuck out to me was the hexagon grille so I started to play with the idea of making this the focal point of the design language, which is how I ended up with my final design. Do you like this so far, or should I try some different style?